Between now and John Bolton taking up his post as Trump's new national security adviser, set to happen April 9, there will no doubt continue to be an avalanche of testimony coming out of US and foreign officials highlighting the crazed and hawkish actions he's taken in the past. Yet Bolton's past actions in government suggest that instead of merely "articulating" his views he's willing to break ranks to get things done on his terms, even reaching out to allied foreign officials to push for preemptive strikes on America's enemies. 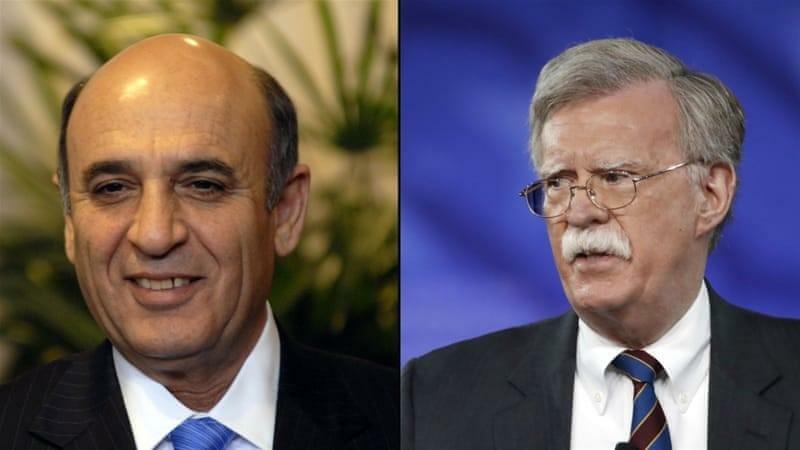 Former Israeli Defense Minister Shaul Mofaz and John Bolton. Image source: Al Jazeera via AP. One notable example of this was revealed in bombshell testimony over the weekend issued by a former Israeli defense minister (2002-2006) and deputy prime minister (2006-2009) who had extensive interaction with Bolton when he was ambassador to the UN under the Bush administration. A former Israeli defense minister and chief of staff said Sunday that John Bolton, US President Donald Trump’s incoming national security adviser, once pushed him to order airstrikes against Iran. “I know John Bolton from when he was the US ambassador to the UN. He tried to convince me that Israel needs to attack Iran,” Shaul Mofaz told a Jerusalem conference held by the Yedioth Ahronoth daily. “I don’t think this is a smart move—not on the part of the Americans today or anyone else until the threat is real,” he added. Ironically Mofaz himself - in line with the Israeli defense establishment - takes a generally hawkish position on Iran, as he told the Jerusalem conference during the same speech, “the Iranian threat is very significant to Israel’s security... It is impossible to guarantee a future for the children of Israel if Iran has a nuclear weapon." And yet he recognized Bolton's proposal as not "a smart move" as the existential threat level from Iran wasn't "real". Bolton, who’s been a resident at the conservative American Enterprise Institute since he left the Bush administration, has advocated for Israel bombing Iran to curtail its nuclear ambitions. This accurately highlights something that shouldn't be forgotten amidst the current national flurry of Bolton commentary: on Iran and other so-called "threats" like Syria and Russia, Bolton speaks from within the very heart of the national security establishment. Mr Bolton, however, is only a by-product of a general policy environment in Washington continually primed to directly confront Iran. Such a policy may not regularly appear overt, but it always seems to lie in waiting. As many will correctly worry that Mr Bolton's appointment raises the likelihood of war with another Middle Eastern country, of equal concern should be his ability to draw upon a robust think-tank, policy and lobbying complex heavily populated with ideas advocating opposition to Iran, designating it as the premier security threat to a stable Middle East, and well-disposed to grease the wheels of confrontation. It should be remembered, for example, that the Iran nuclear deal was struck under the Obama administration at the very moment the CIA and Pentagon under Obama were arming Sunni jihadists in Syria in order to wage proxy war against pro-Iran and regional Shia interests. As one as one formerly secret US intelligence memo spelled out, US sponsored proxy war was geared in the long term toward rolling back "the strategic depth of the Shia expansion (Iraq and Iran)." This had a broad following within the beltway consensus - a consensus within which full and overt regime change in Tehran is hardly a fringe or outlier position. Iran, for its part, has stayed relatively quiet regarding Trump's appointing Bolton as national security adviser. One high official in Iranian parliament called the move "a matter of shame" while highlighting Bolton's closeness to the Iran opposition group in exile, Mujahideen e Khalq (MEK) - considered by Iran and many other countries (and not long ago by the US State Dept.) as a terror organization. But Bolton is not alone here either as the MEK has for years received broad financial and political support from within the Washington mainstream, with dozens of sitting Congressmen and notable US politicians having attended their international conferences on an annual basis. Thus Bolton and others like him are a logical consequence of the system, and certainly don't stand in opposition to it. As the latest testimony from a former Israeli defense chief confirms, Bolton was urging Israel to accomplish the neocons' dirty work in bombing Tehran. This trend really constitutes nothing new, but sadly is more in line with the norm. ...Thus, the real lesson of the Bolton appointment has less to do with Bolton himself and more about what it says about the U.S. foreign-policy establishment. You’re undoubtedly going to read a lot of heartfelt, knickers-in-a-twist commentaries in the next few weeks about the dangers of appointing a wild-eyed radical to such a sensitive position, but the plain fact is that Bolton is not really an outlier within the U.S. foreign-policy community. It’s not like Trump just appointed Medea Benjamin (from the left) or Rand Paul (from the right) or even an experienced and knowledgeable contrarian such as Charles W. Freeman Jr. or Andrew Bacevich. Instead, he appointed someone with decidedly hawkish views but who is still within the “acceptable” consensus in Washington. Look at Bolton’s pedigree and career. He’s a graduate of Yale University and Yale Law School. He worked at Covington & Burling, a venerable D.C. law firm where former Secretary of State Dean Acheson also worked. He has been a senior fellow for years at the conservative but mainstream American Enterprise Institute. He writes frequently for obscure, wild-and-crazy, “radical” publications including, er … the Wall Street Journal, the New York Times, and even Foreign Policy. Is this your idea of a “fringe” figure?